A working mom trying to do it all ....and succeeding! Decluttering a home that’s overrun with the flotsam of daily life is an excellent way to create a clean and orderly home environment. Unfortunately, getting rid of junk means introducing it into the natural environment, including loading up landfills, expelling toxic material into the atmosphere, and sapping precious natural resources. Enhanced environmental awareness among homeowners and a renewed appreciation of nature’s gifts have led many people to seek eco-friendly ways of discarding household material. Today, dragging old mattresses to the dump and using bleach and other harmful liquids to clean are giving way to healthier, safer alternatives. Appliances are a major problem when it comes to disposal because of their size and composition. Unfortunately, people often throw them out because they’re upgrading to a newer, better-looking model, not because they’ve stopped working. This throw-away mentality lies at the root of many environmental issues we’re grappling with today. If that trusty old microwave or refrigerator has looked better, donate it to Goodwill, the Salvation Army, or Habitat for Humanity rather than sending it to the landfill. You can also wait for a community scrap metal drive or post it on a free-exchange website like Freecycle. When it comes to bedding and furniture padding, many people are unaware that these materials can be reused. 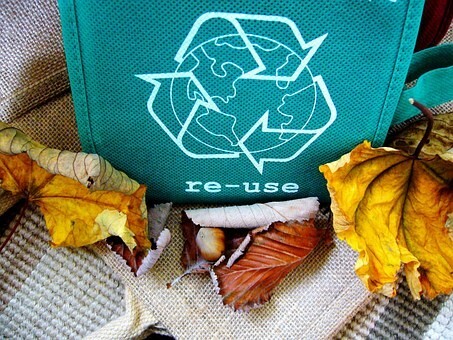 Look for textile drop-off points in your community, or look for a clothing and textile recycling facility nearest you. Electronics and “e-waste” represent one of the greatest threats to the environment. Last year, more than 44 million tons of e-waste were discarded, according to the United Nations, but only 20 percent of it was disposed of responsibly and safely. Many of these products contain heavy metals like mercury, lead, and cadmium. Consider donating old cell phones, keyboards, and tablets to a local non-profit or charity or to organizations like Dell Reconnect or the World Computer Exchange, which refurbish and donate electronics to people in developing countries. Old photos and documents can create a tremendous amount of clutter because they tend to accumulate with alarming rapidity. Fortunately, technology and the storage miracle known as “the cloud” makes it very easy to remove all those loose papers and pictures with a few clicks of your computer mouse. Simply scan photos and documents and upload them to secure digital storage space. That frees you to take it all to a shredder and free up your drawer space. Be sure to consult a tax accountant before you dispose of something you might need to keep a hard copy of. Cleaning your home with products that contain toxic materials is not only bad for the environment, but it’s also unhealthy for you and your family and can cause problems over time. When people clean using products and methods that are free of toxic or unsafe materials, and that are safe for the environment and human health, it is called green cleaning. There are many environmentally safe, eco-friendly cleaning products on the market today that are as effective as anything you’ve ever used. You can also use natural household materials, like vinegar or baking soda, for a number of cleaning needs. Avoid bleach and ammonia, which emit fumes that can cause respiratory problems and are toxic pollutants. Instead of aerosols, use an essential oil like lavender or lemons to get rid of odors. Decluttering your home can be a freeing experience that opens up new vistas of practical and aesthetic possibilities. Decluttering the eco-friendly way takes a little extra effort. It’s as much an investment in your health as it is a means of protecting our environment. I'm a mother of 2 who likes to get involved in too much! Besides writing here I started a non-profit, I'm on the PTO board, very active in my community and volunteer in the school. I enjoy music, reading, cooking, traveling and spending time with my family. We just adopted our 3rd cat and love them all! I am a big fan of natural products, especially ones used on our bodies. I was able to review some natural soap products from Dr. Jacobs Naturals. I am excited to share my thoughts with you on these great natural products. Dr. Jacobs was a Swiss chemist that perfected the long-standing Castilian tradition of making Jabon de Castilla or Castile soap before the turn of the 19th century. Today, we still use the same recipes and work to uphold the long-standing tradition of making natural Castile Soap products. The company Dr. Jacobs was created by Joey and Ezra Aini in the spring 2011. Familiar with cosmetics and skincare from other brands they have launched, they are answering the call of demand from customers for a multi-purpose natural soap product. Dr. Jacobs Naturals offers a line of natural bar soaps and also liquid soaps. I love how these products are free from all the nasties: NON-GMO, Paraben Free, Sulfate Free, Gluten Free, Free of artificial dyes & coloring. PETA Cruelty Free & Vegan. I was able to review 3 products that are offered. Two of them are liquid soap/body wash and one is a body soap bar. Say hello to your tropical paradise. Your shower is transformed into a mini cabana in Hawaii while your body is treated to the indulgence of a pina colada bath. Hydrate and enrich your skin with coconut oil and allow the freshly peeled lime bits to exfoliate, brighten, and renew. The rich pairing will tease your senses and awaken you for the day ahead. 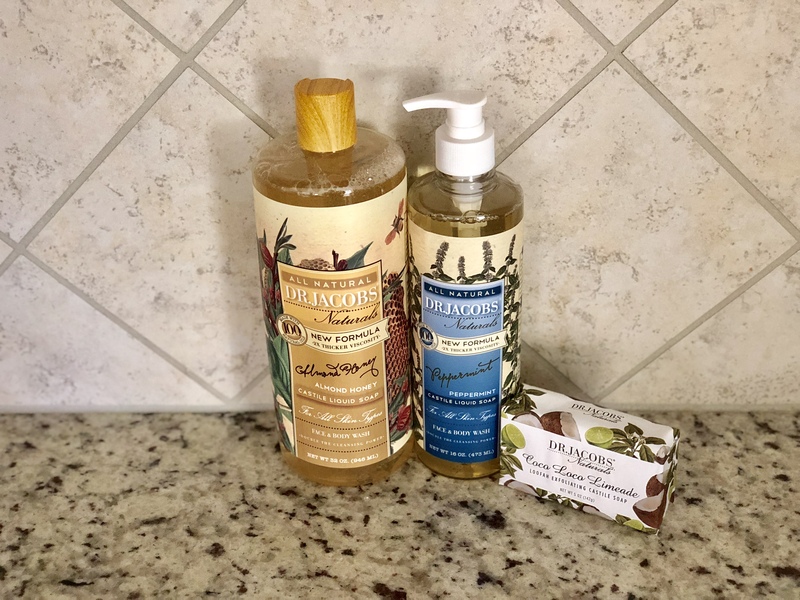 Our Triple Milled Castile Soap with Organic Shea Butter is made with all-natural ingredients void of any chemical derivatives to give you an experience like you’d find in nature. Dr. Jacobs soaps are the most superior as our process allows them to retain their natural glycerin content producing a much more moisturizing experience than traditional bars can offer. No parabens, petrochemicals, sulfates, phthalates. Gluten free. 100% Vegan. 100% recycled paper. Made in USA. Directions: Pour on a washcloth, sponge, or hand. Lather and rinse. Ingredients: Sodium Palmate, Sodium Cocoate, Water, Glycerin, Blends of Essential Oils and Fragrance, Organic Shea Butter, Mint Leaves, Sodium Chloride, Sodium Gluconate, Rosemary Extract, Chlorophyllin. Sodium Palmate, Sodium Cocoate, Water, Glycerin, Blends of Essential Oils and Fragrance, Organic Shea Butter, Mint Leaves, Sodium Chloride, Sodium Gluconate, Rosemary Extract, Chlorophyllin. This bar smells so good! I love the coconut smell with a hint of lime. It is smooth and does not leave a film on your body when you wash it off. $10.95 for 16 oz or $17.95 for 32 oz. This gentle blend of almond and honey is nourishing for the skin and rich in antioxidants. Enriched with sweet Almond Oil, the Almond and Honey blend provides a natural source of Omega 9 to add moisture. Real honey lends its antioxidant and antimicrobial properties, as well as offering the protective ability to retain moisture, keeping the skin hydrated all day, soft and smooth to the touch. Almond oil is a popular essential oil commonly used in aromatherapy and is suitable for most skin types. It is rich in vitamin A, B and E, which are great for skin health. Directions: Pour on a washcloth, sponge, or hand. Lather and rinse. Ingredients: Organic olive oil, coconut oil, sunflower oil, sodium hydroxide, almond oil, aqua, fragrance, honeycomb, jojoba oil, vitamin E.
My favorite scent in the world is the smell of Almonds. I just love it. Mix that with honey….oh my gosh I am in heaven. This soap is just amazing, smell wise and lather wise. It goes on thick and the smell is light when you wash it off. Makes my skin so smooth! The 16 oz comes with a soap pump while the 32 oz does not. Peppermint will cleanse and deliver a soothing and cooling effect for your skin while providing a pleasantly refreshing and tingling sensation. Modern Science has been catching up with Mint and some of the most recent findings show that it is neuro-protective, offering benefits for reducing the risk of reactive oxygen species-related diseases. It soothes the skin and helps to cure infections and itchiness, as well as being a good way to reduce pimples. Its anti-pruritic properties can be used for treating insect bites like those of mosquitoes, honeybees, hornets, wasps, and gnats. The cooling sensation will relieve you of the irritating sensation to scratch. Directions: Pour on a washcloth, sponge, or hand. Lather and rinse. Ingredients: Aqua, organic coconut oil, olive oil, sunflower seed oil, potassium hydroxide, glycerin, clove oil, tea tree oil, citric acid, caramel. Who doesn’t like the smell of peppermint? I was a little skeptical of this scent because I have never thought of washing my body with a peppermint scent. It is wonderful! Very light but pleasant. The liquid is just like the Almond Honey, where it is thick and makes my skin very smooth. The 16 oz comes with a soap pump while the 32 oz does not. I received the mentioned products in exchange for this blog post. All opinions are my own. My name is MJ. I have two wonderful children and work part time as well as volunteer at my children's school. Cutting the cost of heating our homes can be a long and daunting project. Just keeping the water warm can be costly enough, let alone the whole house. If you live in an older house that is difficult to keep warm or are considering building a new house, you should consider switching to solar power and do your part for the environment. Solar panels are a great way to go to keep costs low but they also cut back on non-reusable fossil fuels for electricity. With solar panels installed you don’t need oil, gas, coal or timber to keep your home warm and cosy. Solar panels work by absorbing power from the sunlight, storing it in the panels and converting that power into electricity. The result is truly clean energy and it never runs out. It’s a great alternative to using fuels that pollute the environment and run up your monthly household bills. Keep reading to find out what you need to consider when making the switch to solar. Costs of panels can vary, however, it’s important to invest in a quality setup to save yourself money down the line and get the most from your panels. Despite the initial investment, solar panels will pay for themselves with the amount of money you save on fossil fuels and the reduced impact you will be making on the environment. 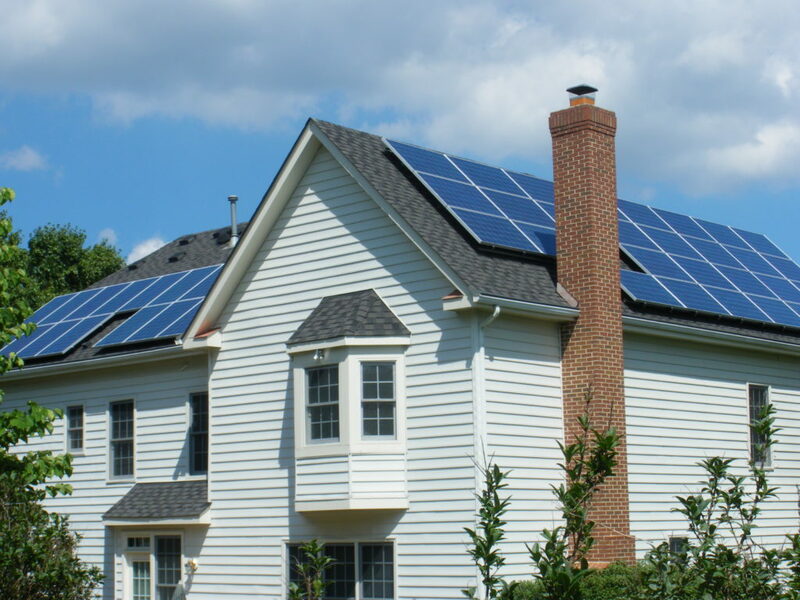 When it comes to getting the best return form your solar panels, more is more. If you want to install enough panels to make your home generate enough to be self-sufficient, then it will be more expensive than just installing a few to help ease the cost of heating. Make sure to consider the size of your home and what your expectations are before choosing a setup. A solar panel can store about between four and five watts per square metre, so for every kW you generate, you need about forty to fifty square metres of solar panels. Many companies offer incentives and there are also tax benefits for businesses for having these panels installed, and the costs saved in the long term are definitely worth it. Usage and other factors will play a big part in these equations, as well. If you have several people living at home, all taking showers, running appliances, and are in your home around the clock, it will cost more than a couple who are not home much, eat out or go away at the weekend. The cost of installing enough panels to meet your usage will vary between suppliers. Other factors, like where you live, if you are running a hot tub or air conditioner and whether incentives are offered, are also worth considering. Having panels installed in a new house or an older one can make a difference in the overall cost for installation, as more work or materials may be involved in an older building and this can be worth taking into account. Ask around for pricing and talk to your neighbours and friends about their solar panels. It’s always good to go with a reputable company that someone you know can vouch for. The savings solar panels offer in the long run are well worth it, not only for the money you save in electric bills but also the reduced impact on the environment. Once the systems are in place, they need very little maintenance and will pay for themselves for years to come. The beauty of solar panels is they produce zero waste and cut your costs considerably. You will need to shop around for the best pricing and for what will suit your needs best. It’s also important to consider the size of your home, your energy usage and what your goals are with your new panels before starting your installation. However, once your panels are in place, you’ll be ready to enjoy all of the benefits they provide now and long into the future. Green roofs on commercial and residential structures provide an array of different types of benefits. In a growing number of municipalities, a requirement exists for the inclusion of green roofs on certain types of commercial buildings. If you are contemplating a green roof for your business, whether because of a requirement in your community or because it is your voluntary decision, there are some factors regarding rooftop gardens that you need to bear in mind. At the heart of a roof garden system is layers that form the foundation of a green roof. A key to the system is to ensure that it is fully waterproof and does not allow seepage into the building. The typical rooftop garden has between six to seven layers. Beginning from the bottom and moving upward, a green roof “foundation” begins with a high quality waterproof membrane. On top of the membrane is a root repellant system followed by what sometimes is considered an optional layer of insulation. Next, a green roof is layered with a drainage layer followed by a filter cloth for fine soils. The next lawyer is a lightweight growing medium or type of soil substrate. Finally, at the top, a green roof is completed with plants of different types. In most cases, an additional step is taken to assist with drainage, fire control, and access to permit roof maintenance. This usually consists of a shallow layer of gravel, or pebbles, that is placed around the outside perimeter of the rooftop garden. As noted previously, there is an array of different types of benefits associated with a green roof. One of the key benefits associated with a green roof is a reduction in heat loss and in energy consumption during colder months of the year. In warmer months, a green roof can assist in reducing the cooling load on a commercial building. A broader benefit of a green roof is that it can lower urban air temperatures. For this to be accomplished, there must be a concentration of green roofs in metropolitan area. This is one of the reasons why some municipalities are making green roofs a requirement for certain types of commercial structures. A green roof also assists in reducing storm water runoff. It also provides increased sound insulation. The installation of a green roof improves a building’s LEED rating. A roof garden also increases the lifespan of a roof. There are two primary types of green roofs in place in this day and age. These are intensive and extensive. The primary underlying differences between these two types of green roofs are accessibility and required maintenance. Intensive green roofs are designed for human interaction. These types of green roofs have easy access and more elaborate landscapes. These roofs include things like small trees, shrubs, fountains, and walking paths for human enjoyment. As a result, these types of green roofs require more in their construction and maintenance. Extensive green roofs are designed to be self-sustaining and require minimal maintenance. These types of roofs are not designed to human interaction. Extensive green roofs also feature different types of vegetation. These types of roofs feature vegetation like self-seeding sedums, certain types of grasses, mosses, and meadow flowers which require very little irrigation and maintenance of any type. In order to fully install a green roof, and tend to perimeter matters, scaffolding oftentimes is utilized. Scaffolding can be an invaluable piece of equipment in the creation of a green roof. The key to making the best use of scaffolding in creating a green roof is to make sure all safety considerations are met. This includes properly assembling and placing the scaffolding in the first instance, making sure people are properly trained on use of a scaffold, and ensuring that materials used on a scaffold are secured appropriately. The cost associated with a green roof depends on a variety of factors, including whether an intensive or extensive derivation will be selected and the location of the building on which a rooftop garden will be created. With that noted, there are now professionals with experience in installing green roofs in many major municipalities. These pros can provide estimates on the cost of installing a green roof on a commercial structure. Jessica Kane writes for Advance Online, a leading provider of web-based OSHA. DOT. and HAZWOPER training. 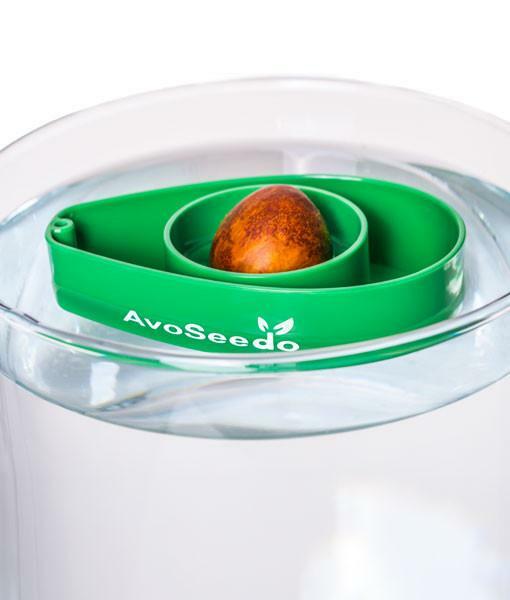 Grow your own Avocado Tree at home with AvoSeedo! Do you love Avocado? How about delicious homemade guacamole? I honestly cannot get enough of Avocado. I eat it on my sandwiches, love it on burgers and of course I love making fresh guacamole to enjoy. I was contacted by a company called AvoSeedo to review their product to grow my very own avocado tree! AvoSeedo is a small plastic bowl that features an indentation with a hole in it. A single avocado seed can be inserted with the “flat” end facing down. Afterwards, AvoSeedo can be placed in a sufficiently large, water-filled pot. Due to its low weight and high displacement, AvoSeedo will remain at the surface all the time; as the water level lowers, AvoSeedo will sink accordingly. 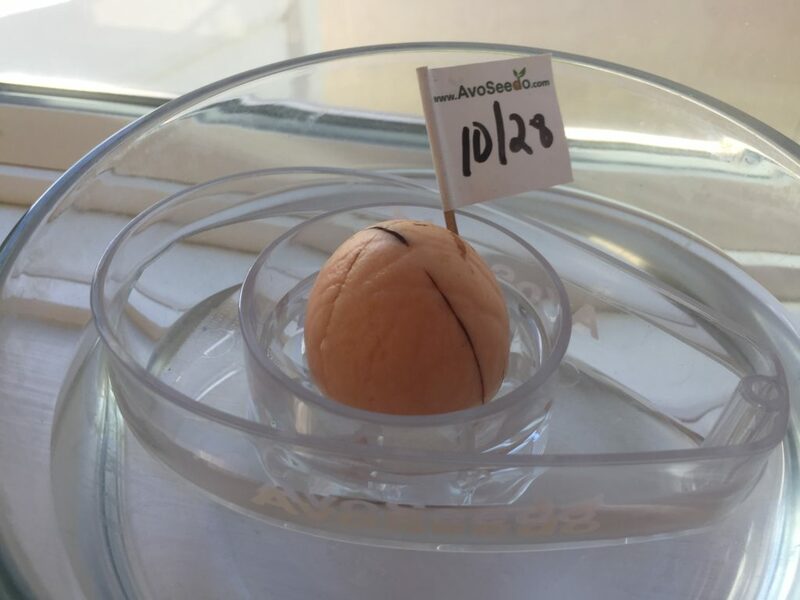 With AvoSeedo, you can significantly raise the success rate when it comes to avocado germination. Without any risk, you can decrease the watering intervals drastically. Only from time to time you will have to check the water level of the pot containing AvoSeedo plus avocado seed. Compared to the original toothpick method, there’s another advantage: the avocado seed doesn’t need to be perforated, reducing the risk of damage (and thus, failed germination efforts). And finally, AvoSeedo features a mounting that can be used to attach small flags. These can be inscribed with the date when germination started, with strain names or with additional information. Thus, you can easily keep track, even when germinating several avocado seeds at the same time. The AvoSeedo website offers great information on Avocados and on how to grow your own Avocado tree. They offer many products to choose from. I was able to review the AvoSeedo in the transparent color. They offer transparent, green, blue and pink. Directions are simple, all you need is an avocado pit. The website offers great instructional videos too. My pit has already started the process of roots and I am excited to continue to watch it become an avocado tree. My kids really enjoyed the whole process, it was a great educational experience for them. It will increase kids’ understanding of ecology, interconnections in nature, responsibility and care for the environment in a participatory and concrete way. Great for all ages! This would make a great holiday gift for any avocado lover you may know. The AvoSeedo is on sale for $12.99. 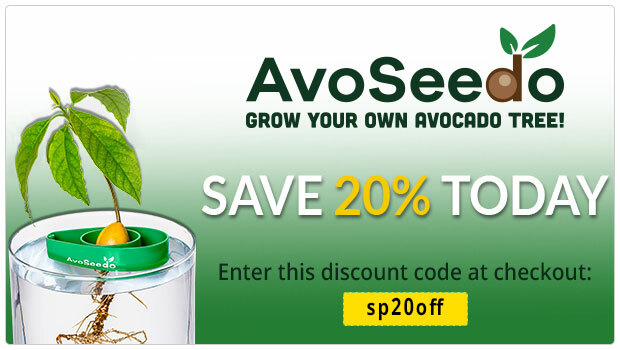 Save 20% on any AvoSeedo avocado grower or other product and enjoy FREE shipping too. Visit the AvoSeedo Shop today and get growing today! *I received this product in exchange for this review. All thoughts are my own. Hey there! My name is Anne and I'm a mother of 2 who likes to get involved in too much! Besides writing here I work as a paraprofessional, I started a non-profit and am very active in my community. I enjoy music, reading, cooking, traveling and spending time with my family. We have 3 cats and 1 dog and love them all! Be Koool Fever Cooling Gel Sheets Review and Giveaway! The Avenues Mall Hosts Tea Time With The Easter Bunny On March 19th!